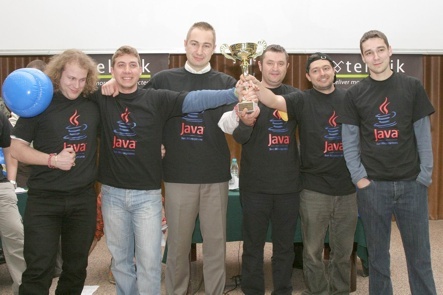 The Java team won the second IT Boxing match on Web technologies on 6 March 2008. The battle was merciless: 24 contestants in 4 teams (.NET, Java, PHP and Ruby) fighted for proving their technology better in 9 technical talks with live demonstrations. The teams presented ASP.NET, ASP.NET AJAX, ASP.NET MVC, Echo2, Google Web Toolkit, JavaServer Facaes and other Java EE technologies, PHP, Symfony framework and Ruby on Rails along with lots of demonstrations and discussion. The event was attended by about 350 software engineers. The technical talks and discussions were more than 5 hours so some of them didn’t stay until the end and didn’t voted. Browse the photos from the IT Boxing for Web Technologies. We recorded the fight so everybody can enjoy it. Download the video: Video-IT-Boxing-Java-MS.NET-PHP-Ruby-6-March-2008.avi. You are currently browsing the IT Boxing blog archives for March, 2008.